What exactly is modular design? Well, think about it like building blocks – you can build a simple, practical structure to start with and then expand this structure by adding enhancements to it. Teachworks works in the same way. By default, you’re presented with all the basic elements you need to manage an education business – you have access to employees, customers, billing, employee hours, scheduling and analytics. You can then build on this by enabling add-ons and integrations. Simply put, you have full control over how simplistic or complex your Teachworks account is. In addition, you can further tweak your account by customizing account settings and notification templates. Customizable design comes with a number of benefits. 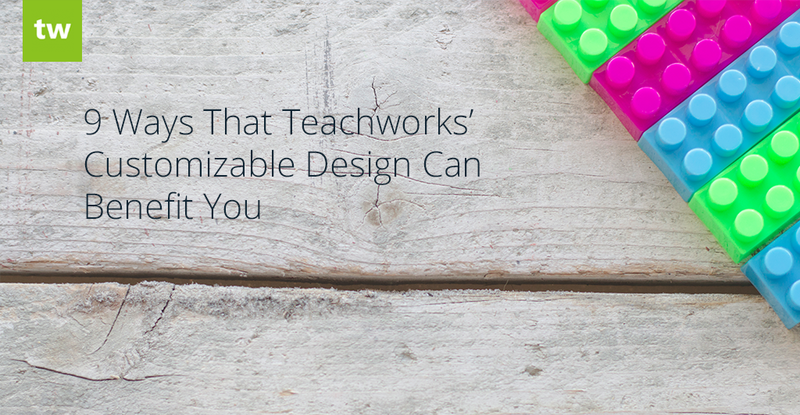 Here are 9 ways in which Teachworks’ customizable design can benefit your education business. The most important goal for any teaching business is generating more business and scheduling more lessons. Using software that makes the scheduling process tedious will affect your business negatively in the long run since you will waste precious time and resources that could be used elsewhere. Website Booking Plugin – With this plugin you can add a booking button to your website. Your customers can easily use this to book lessons, join open classes or sign up for courses. With this approach, your customers are handling the admin for you since they are scheduling their own lessons. Lesson Requests Add-On – This add-on allows students to request lessons through their Teachworks account. All the lesson details are pre-filled and the company admin or staff only have to approve, decline or modify the request to add the lesson to the calendar. Open Classes Add-On – This add-on allows you to schedule open classes and set a student limit. Aside from scheduling the lesson, there isn’t much else you need to do. Students are automatically added to the lesson as they join from the Website Booking Plugin or from their Teachworks accounts. Copy Feature – With this feature enabled, you can quickly and easily copy lesson settings to add similar lessons to the calendar. By enabling only the add-ons and integrations you need, you can create a streamlined interface without the clutter caused by irrelevant features. This allows you to navigate through menus much faster, thereby increasing efficiency. In addition, it reduces confusion and speeds up training as each visible feature is actively used. Your education business will likely go through different stages of growth. As your business expands, you may need to start using more add-ons and integrations. In Teachworks, this process is very simple – simply go to the Integrations & Add-Ons page and enable the necessary feature. For example, if you’re just starting out, you may not need to delegate tasks to your employees. As your business expands however, your workload might become overwhelming and you may need to start delegating some of your work to members in your team. In this case, you can enable our Task Add-On to quickly and efficiently delegate tasks to staff and teachers. Experimentation is vital for business success because it provides you with valuable insights that you can use to make your business more profitable. Teachworks’ customizable design allows you to enable certain features to conduct experiments. If the feature doesn’t add any value to your business, you can simply disable it. For example, you may want to send SMS lesson reminders to your customers to see if this reduces the number of no-shows over time. The open rate for text messages are generally much higher than emails, so this might be an effective strategy for your education business. If there isn’t a significant change in attendance, you can simply disable the feature. Each add-on and integration comes with its own customizable settings. This allows you to further customize each feature to meet your specific business requirements. For example, you may want to use our Website Profiles Add-On to display information about each of your employees on your website’s “Meet the Team” page. This feature allows you to choose between a grid or a directory layout, so you can choose the option that displays best on your website by simply customizing your settings. In addition, you can customize the colour of the button or name tag that appears on the add-on to perfectly match your website’s look and feel. Our customizable design allows us to add tailored solutions for specific types of education companies without affecting unrelated companies. If a feature is not relevant for your business, you can simply omit it from your account. Read more about our tailored solutions for different types of education businesses. We are always adding new add-ons and integrations to our list based on the feedback we get from our customers. We understand that not all features will be relevant to your business and our customizable design allows us to release these features without disrupting you. While the feature is added to your Integrations & Add-Ons page, you have full control over whether or not it is enabled in your account. The Account Settings page controls many aspects of your Teachworks account. A great example of this is the Terminology Settings section. Not all education businesses refer to customers as “Students” or teaching staff as “Teachers”. For this reason, we’ve added the option to customize these terms so that you don’t have to compromise at all. We understand that each business has a unique tone and identity which is why we’ve created fully customizable notification templates that you can tweak as needed. Each notification comes with a set of merge tags that you can use to personalize each message. In addition, you can also customize the invoices that you send to your customers. Our Custom Invoices Add-On allows you to easily adjust the labels and layout of invoices. This is a great solution for companies wanting to translate invoices or rearrange certain elements. A customizable interface can greatly benefit your business in many different ways. You can work smarter and more efficiently by only enabling features that are relevant to your business. You can run experiments to gain valuable insights that will allow you to make informed decisions that will lead to more profitability. You can make each piece of communication a personal experience by using merge tags and adding your unique touch to each notification template. We strongly suggest spending some time reading more about each of our free add-ons and integrations. We’ve carefully created each feature with the aim of streamlining tedious business processes and allowing our valued customers to streamline their business. Make the most of your Teachworks account by utilizing each feature that will add value to your business.